The Days of Johann, an agility dog! 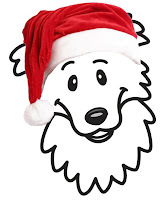 : Last Day of Johann's Howling Howliday Giveaway! Last Day of Johann's Howling Howliday Giveaway! It's Christmas Eve!!! And it's the last day of my giveaway today, so only one more chance to enter and win! Before we go on to the prizes, I just wanted to say how grateful I am to all the amazing contributors to the giveaway this year. 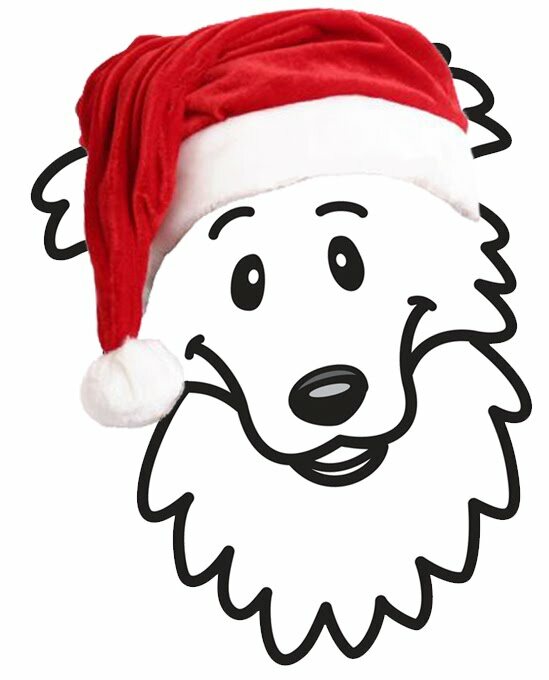 Their unwavering generosity this Holiday season has enabled us to share some great products with you, and help raise funds for a much needed cause - A Place to Bark. Big thanks to them and to all the folks who entered and contributed to our designated charity this year, you ROCK!!!!! So on with the prizes! We have three contributors today who have donated some great prizes for our winner. 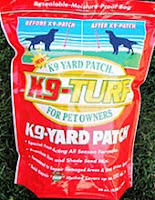 To help you get ready for Spring lawn care, K9 Yard Patch is donating Two Bags of K9 Yard Patch (30 oz. ea.) to our lucky winner today. Now this isn't any ordinary grass seed. It's green grass seed - and that means their lawn and turf patch products are designed to be safe for the environment using the highest quality organic products that naturally condition and repair the soil while retaining moisture for rapid germination of the seed. Their proprietary naturalized grass seed is formulated to match your existing lawn and each bag covers about 250 sq. ft.
K9 Turf Products has a full line of seed and fertilizer products that are safe for pets. They are a family-owned grass seed supplier with over 80 years of combined experience in the grass seed business. Their patented formula of seed, organic matter, and organic soil conditioner is an environmentally responsible solution for repairing your lawn. And you know how much we love organic and environmentally friendly! And to top it off, K9 Yard Patch is offering our readers a deal! Just buy one bag of K9 Yard Patch and get another one free! All you have to do is call Jean at K9 Yard Patch; 253.627.8008. Woof at the Door is our second contributor today and they are donating a Personalized Photo Ceramic Tile Coaster Set + Personalized Photo Porcelain Holiday Ornament, so those Holiday memories (or any other memories throughout the year) can live on furever! 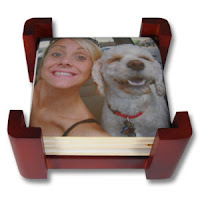 Woof at the Door provides an amazing array of personalized photo products that add joy to people's lives and allow them to express their regard for their four-legged family members; everything from coffee mugs, t-shirts, and charm bracelets to garden stakes, dog bowls, travel gear, note cards and more, all with your pups photo! And it's easy to order, just upload your photo, select your products and place your order! 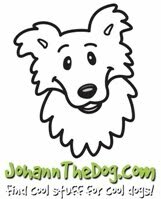 And for my readers, Woof at the Door is graciously offering a 20% discount on any orders purchased today, just use code: JOHANN. Our third contributor today is me!!! Yep, that's right I'm donating one of the products we offer on JohannTheDog.com - the Amazing Treat Machine! The Amazing Treat Machine is a fun and exciting, innovative, interactive dog toy with a basic concept. It automatically rewards your dog with treats when he or she drops a tennis ball inside. The tennis ball goes in...and treats come out! You know how much I love games...so I wanted to share this one with you! When it's cold outside, or super hot and I need some fun and entertainment, Mum feeds us our kibble in the Amazing Treat Machine and I love it! Hope you will too. 1. If you're on FB, go to the Woof at the Door Facebook Page and 'like' them. 2. And while you're over on FB, I'd love if you liked my page too! 3. Click here and subscribe to my blog! That's it, now go get started...you have until 11:59 PM ET tonight (December 24, 2010)! For all the fine print rules, click here. Contest is open to all US residents, 18 years or older in the 48 contiguous US states. Apologies to our friends North and South and across the pond. EDIT: We have a winner!!! Rebecca is the winner of the last day of Johann's Howling Howliday Giveaway! Congratulations Rebecca! Hope you have a wonderful Christmas with running water, electricity and lots of presents for you and Gracie! I did all of the above. I would love love love that treat machine but all this stuff sounds wonderful! Merry Christmas! Happy Christmas Johann! I visited all the websites and have my fingers crossed! kimberly dot annis at gmail dot com. Visited all the websites and LOVE the amazing treat machine! rlannis01 at gmail dot com.